Patrick and JB talk about Fargo. Mostly. I know I'm not alone in saying this, but I LOVE Fargo! It's probably my favorite Coen Brothers movie, and between this and a few other performances she's given (but primarily Almost Famous), Frances McDormand is one of my favorite actresses working today. She's SO great in this movie. the acclaim over her performance was very much deserved. Thanks! There should still be a 'search' box at the top left of the page. "Fargo" was the first film by the Coen's that I actually liked. Their films always seemed to be strange just for the sake of it. 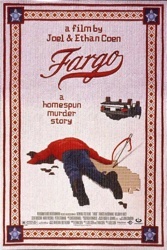 "Fargo" was the first one I found I could tolerate all the way through--and the last 10 minutes of this film, plus the way the title is introduced, knocks me out every time. People always talk about movies being an injection to the heart when describing excitement. This is one of the few films that actually injects morality and then leaves you saddened by what people can do to one another, but also the hope that we can make it better too. I think No Country For Old Men is my favorite Coen movie, but I also really love True Grit. The story of No Country is fantastic to me, and I would watch Tommy Lee Jones read the phone book, but True Grit is a world I love to play in for a while. And Fargo is awesome. I like what JB said about how you all feel like true romantic love is possible and life is an adventure. I think a lot of us here feel the same way, and that's something that a lot of podcasts, particularly in the film genre, seem to lack. There's a hopefulness and a joy in things that I'm not seeing a lot of other places. It doesn't mean you love everything, just that you WANT to love everything. You guys are all very open minded and willing to try things. I could stand to be a bit more like that in my own life. Honestly, it's kind of inspiring. Did you ever know that you're my hero? You're everything I would like to be? I can fly higher than an eagle...AAAAAAAAAND scene. Hopefully my wife Bree heard what you said about her getting me some of those BFI Film Classics books. There's an entire library of them, and I've wanted several of them for a while. I mean, you pretty much told her to do it, so I feel good about it. Thank you. Thank you. Thank GOD for you. The wind beneath my wings. Great podcast as always, gents, and yeah, what a great movie. I was only 16 when I watched it and, though I've found a lot more to appreciate about it since, it just really hit me in all the right places then. I've always loved re-watching a great movie with someone who hasn't seen it and I remember taking the opportunity to help pop as many Fargo cherries as I could when it came out on VHS (it's quite possible it never even played at my little 1 movie/week theatre) and no one was ever disappointed. I want to watch it again right now! Maybe I'm wrong (I was listening at work so may have missed it) but I don't think you guys touched on the "Not Actually Based on a True Story" aspect - such a weird little twist, almost a prank on the viewer. Like, I remember totally buying it as a true story the first time I saw it - finding out it wasn't true certainly didn't diminish the film in any way (and in some ways even strengthened it) but really, what was up with that? Did you guys go into it knowing the gag? Were you disappointed, indifferent or tickled with that little misdirect? Awesome take on this. The Coens have probably been my favorite American filmmakers from the past several decades, and I think Fargo might be my favorite. One quick, incredibly minor note — the Big Lebowski is (at least from what I've seen and read) more like a Raymond Chandler novel, not James M. Cain. Specifically, it's more like Chandler's The Big Sleep. Cain and Chandler operated in the same hard-boiled world, but tonally Chandler was closer to the Lebowski plot framework and dialogue patter than Cain's brooding, introspective material.